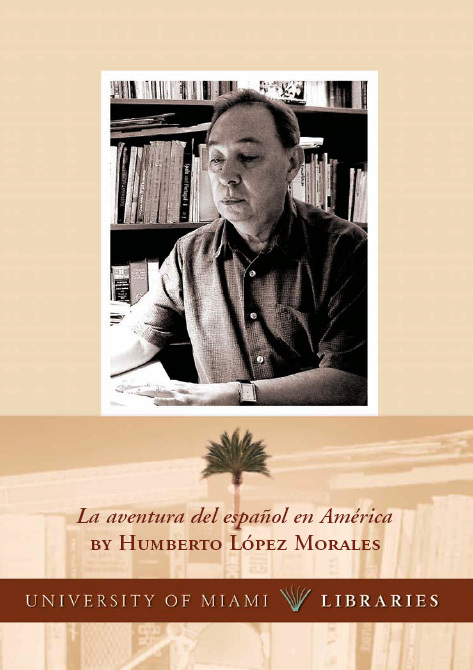 The University of Miami Libraries’ Cuban Heritage Collection will sponsor the presentation of the second edition of La aventura del español en América by internationally recognized scholar Humberto López Morales on Tuesday November 15 at 6:00 p.m. at the Richter Library Roberto C. Goizueta Pavillion. Cellebrated writer and journalist Carlos Alberto Montaner Hill introduce the author and his work. López Morales was born in Havana, Cuba in 1936. He received a Bachelor’s degree with a concentration in Literature and Linguistics from the University of Havana in 1958. He was later awarded a second Bachelor’s degree with a specialty in Romanic Philology from the Universidad Complutense de Madrid, where he also obtained a PhD in Arts and Sciences with a major in Philology in 1962. Throughout his distinguished teaching career López Morales has taught and lectured at some of the leading universities in the United States and Latin America and has been on the editorial board of some of the most prominent academic publications in Philology and Linguistics. The author has been Secretary General of the Association of Academies of the Spanish Language since 1994 and President of the Hispanic Caribbean Linguistics Society since 1978. His publications comprise over two hundred and fifty essays and more than fifty books including: Tradición y creación en los orígenes del teatro castellano, Estudios sobre el español de Cuba, Introducción a la lingüística generativa, Estratificación social del español de Puerto Rico, Sociolingüística, Métodos de investigación lingüística, La aventura del español en América y Los cubanos de Miami/Lengua y sociedad. In 1992 he was recognized by scholars worldwide with the publication of a book in his honor, Homenaje a Humberto López Morales. Other honors include honorary degrees from some of the most prestigious universities of Spain, including Salamanca, Valladolid, Alicante and Alcalá. La aventura del español en América is a study of the evolution of the Spanish language in Latin America which aims to show that, after centuries of political and sociological changes and regional differences which would tend to weaken its unity, Spanish remains a cohesive language with more similarity than divergence on both sides of the Atlantic. The presentation of the second edition will be conducted in Spanish. A reception will follow the presentation. appreciation to Commissioner Rebeca Sosa, District 6.